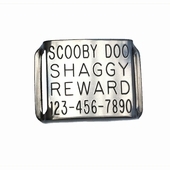 Stainless steel dog nametags that slide on your dog's collar. These name tags come with a lifetime guarantee. 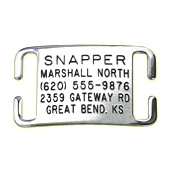 For buckle-style collars. Stainless Steel. Won't come off, make noise or become unreadable - guaranteed. The last ID tag your dog will need. 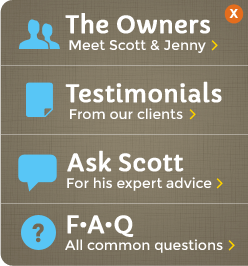 For thicker buckle-style collars. Stainless Steel. Won't come off, make noise or become unreadable - guaranteed. The last ID tag your dog will need. These fit collars with a plastic clasp/snaps. Stainless Steel. Won't come off, make noise or become unreadable - guaranteed. 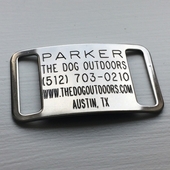 The last ID tag your dog will need.